Learn all about Droncit for dogs. Droncit (praziquantel) is used to treat tapeworms in dogs and cats. Droncit requires a prescription, and is sold per tablet. Praziquantel is a cestocide. Praziquantel works by damaging the parasite’s skin internally so the parasite disintegrates and is removed by the pet’s immune system. Droncit (praziquantel) is absorbed, metabolized in the liver and excreted via the bile into the digestive tract where its cestocidal activity is exerted. Following exposure to praziquantel the tapeworm loses its ability to resist digestion by the mammalian host. Because of this, whole tapeworms, including the scolex, are very rarely passed after administration of praziquantel. It is common to see only disintegrated and partially digested pieces of tapeworms in the stool. The majority of tapeworms killed are digested and they are not found in the feaces. Dogs infected with E. multilocularis should be treated to prevent exposure of humans to infective eggs and to reduce perpetuation of the parasite’s life cycle. The dosage of Droncit Injectable solution for removal of E. multilocularis is the same as that indicated for the removal of the other tapeworm species listed on the label. Laboratory efficacy studies have demonstrated the recommended dosage is 100% efficacious for removal of this tapeworm. Though a single dose may eliminate most of the worms, a second dose may be required to be taken if reinfestation is highly possible. It is also ideal to always clean your pet and its surroundings. Also, always check for fleas and ticks, it is best to treat your pet immediately and have a year round control. Worming treatments for pets are fairly well-known for having messy side effects, often causing a pet to purge and be sick or suffer from diarrhea. To minimize this, wormers usually need to be given to pets that have fasted for 12 hours, so that the animal has an empty stomach. This is something which is easier to say than do how many of us can resist when our cat or dog lets us know that he is hungry? Droncit works quite differently and therefore Droncit tablets can be given to a pet with food, which seems to make side effects quite rare. Side effects which have been reported for Droncit include drowsiness, drooling, staggering and in only 5% of cases, nausea. However, it is worth remembering that the side effects of Droncit are infrequent, especially when compared to other worming treatments. Droncit is an anthelminthic (dewormer) used to treat tapeworm (cestode) infestations. 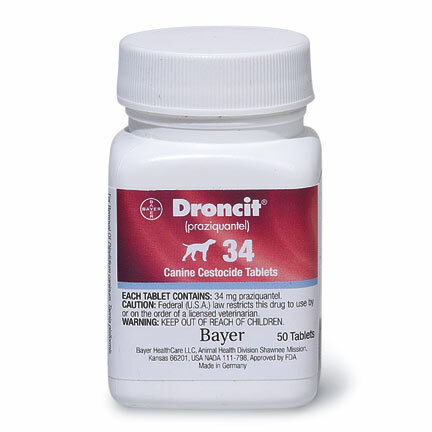 Droncit Canine is a prescription medication FDA approved for use in dogs as 34mg tablets. Droncit is a canine cestocide tablet found to be effective in the removal of canine cestodes. Tapeworm infestations like Dipylidium caninum, Taenia pisiformis, and Echinococcus granulosus can be effectively cured with the administration of Droncit Canine Cestocide Tablets. Besides, Droncit is also beneficial for the removal and control of Echinococcus multilocularis. Droncit is considered to be the best medication in removing tapeworm infestations in dogs and cats. Droncit mechanism of action is started within a few seconds of the tapeworm coming into contact with praziquantel its interaction with phospholipids and proteins cause damage to the tegument. The inflow of Ca+2ions results in an immediate contraction of the entire strobila. Moreover, these changes lead to a reduction of glucose intake and an accelerated depletion of energy reserves. DRONCIT`s mechanism of action against tapeworms has been investigated with in vitro Hymenolepis diminuta. At very low concentrations (1.0 –10 µg/l) DRONCIT stimulates the motility of H. diminuta and impairs the functional ability of the suckers. At concentrations of 10 – 100 µg/l and above the substance causes very strong contractions of the entire strobila. At concentration of 1 mg/l (1ppm) this contraction takes place the moment the worm comes into contact with active ingredient solution. This very pronounced in-vitro effect of DRONCIT on tapeworms and the rapid onset of action after the treatment of the host suggest that DRONCIT itself is the cestocidal substance and not its metabolites. The studies of DRONCIT`s mechanism of action against tapeworms performed to date have shown that the drug has an effect on carbohydrate metabolism. The uptake of glucose by the tapeworm is dose-dependently reduced by the administration of Droncit at active concentration of 100 µg/l. The excretion of lactate was not dependent upon the presence of glucose in the surrounding solution. This suggests that lactate excretion is due to an effect on endogenous carbohydrate, probably glycogen. A reduction in the levels of glycogen in worms of the species H. diminuta was detected in rats which had been treated orally with 25 mg DRONCIT/kg: 2 hours after administration the glycogen levels in the worms were 20 – 50% lower than in the worms of the placebo-treated control rats. It was also demonstrated that the tegument of the worms becomes permeable to glucose as a result of the administration of DRONCIT. If H. diminuta treated with DRONCIT were transferred to a glucose-free medium, the parasites released glucose into the surrounding medium. Droncit dosage depends on the age and weight of your dog or puppy. Give Droncit exactly as directed by the veterinarian. The usual dose of Droncit Canine for dogs and puppies at least 4 weeks old is up to 5 lbs. give 1/2 tablet, 6-10 lbs. give 1 tablet, 11-15 lbs. give 1 and ½ tablets, 16-30 lbs. give 2 tablets, 31-45 lbs. give 3 tablets, 46-60 lbs. give 4 tablets, and over 60 lbs. give 5 tablets maximum. The tablets may be crumbled and mixed with food. Droncit 1 tablet costs $5.64. And 20 tablets cost $112.80. Droncit side effects though not may significant or severe have been reported yet, there are certain instances where animals exhibited symptoms of anorexia, vomiting, lethargy and diarrhea.